I love Red Velvet anything. Love love loooove! Red Velvet is basically vanilla with a hint of chocolate, that is dyed a vibrant red. These Healthy Red Velvet Brownies, on the other hand, are just like any regular brownie — fudgy, moist, dense, sweet, chocolatey — only with a lovely (naturally) reddish hue. Red Velvet Brownies. It can’t get better than that, right? Oh wait, it just did — HEALTHY Red Velvet Brownies! Yup, I said it, these brownies are good for you. 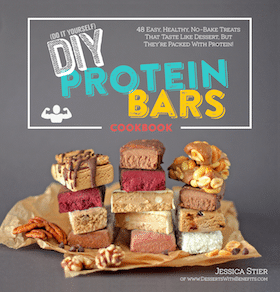 They are 100% whole grain, free of refined sugar, gluten free, and vegan to boot. Oh, and they’re hiding a VEGETABLE. 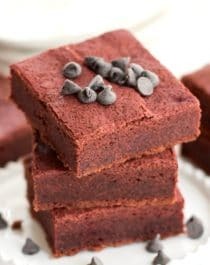 Feel free to add a big sprinkle of mini dark chocolate chips to the batter as you make these Healthy Red Velvet Brownies. Emphasize that chocolate yo. Chocolate lovers, REJOICE. Because there is no such thing as too much chock-oh-law-tay. 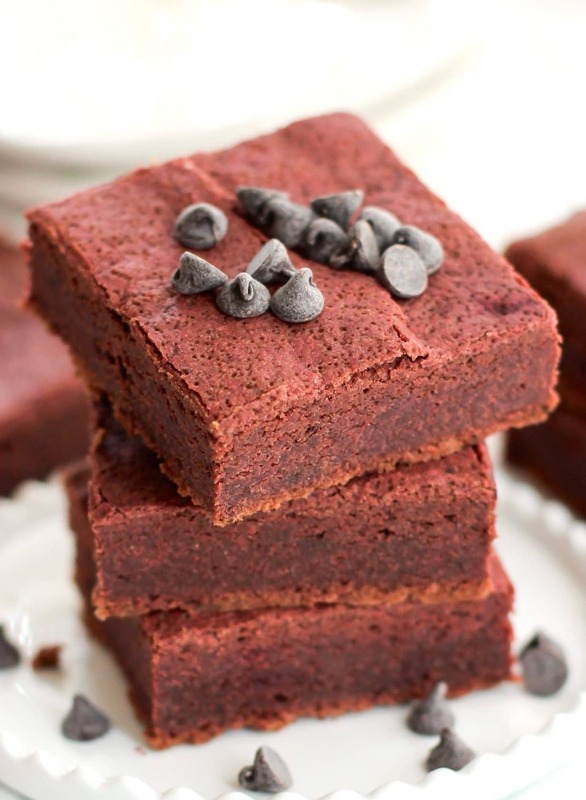 These Healthy Red Velvet Brownies are good for you! They are 100% whole grain, free of refined sugar, gluten free, and vegan to boot. They're hiding a VEGETABLE! Rinse and gently scrub 3 medium beets, then individually wrap them in foil. Preheat the oven to 350 degrees Fahrenheit and line an 8x8" brownie pan with parchment paper both ways. 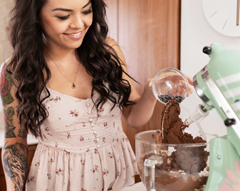 In a small bowl, whisk together the oat flour, erythritol, sorghum flour, cocoa powder, baking powder, salt and xanthan gum. In a large bowl, whisk together the beet puree, melted cacao butter, warm almond milk, vanilla extract, butter flavor and stevia extract. Dump the dry ingredients over the wet ingredients and whisk well. Last, whisk in the vinegar and optional mini chocolate chips. Scoop the mixture into the prepared pan and spread it out with an offset spatula. Bake for ~34 minutes, or until the center of the brownies spring back when tapped. Let cool, then slice and serve. 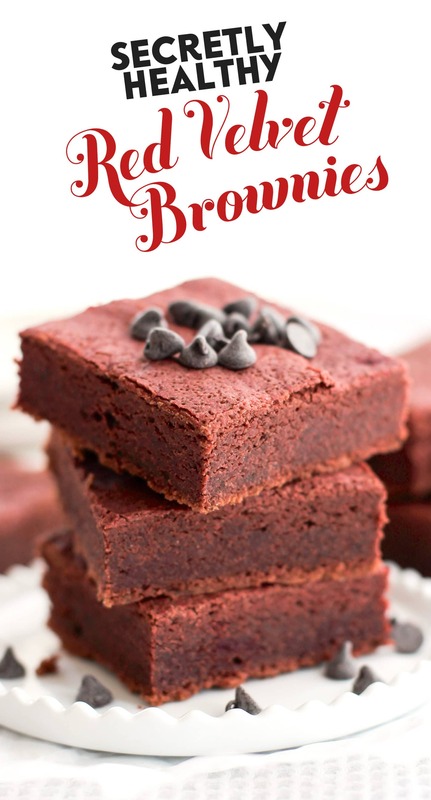 Compared to typical brownies, these brownies are lower calorie and higher fiber with no added sugar and zero cholesterol! 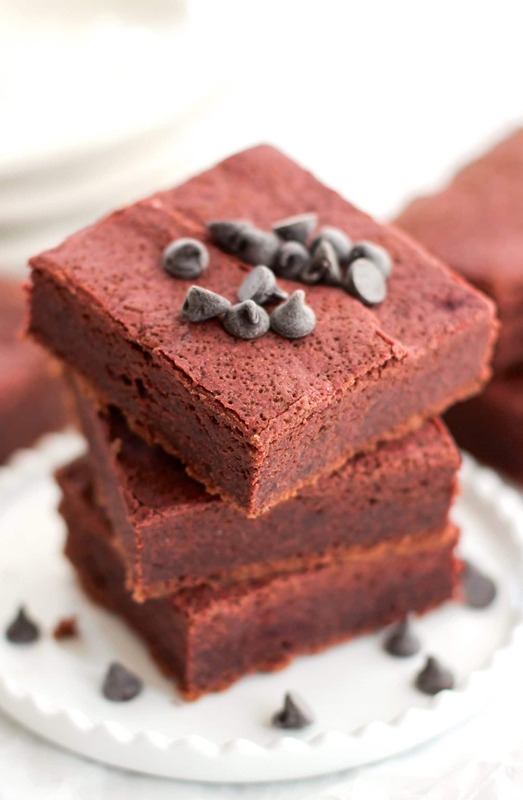 As a beet and chocolate and brownie lover–these look amazing. One question: I don’t have Ener-G egg replacer–roughly how many equivalent eggs, egg whites, or flax/chia eggs would the amount listed be? Thanks! You can omit the egg replacer and reduce the almond milk from 1/2 cup to 1/4 cup, and you can use one whole egg instead. They look a bit underdone… Interesting though! I just can’t get over the nutritional information, it’s astonishing! Well done for making everything so healthy! These sound delicious, but I only have white wheat flour…do you have any hunch if these could still work? Sorry, I know pretty much nothing about gluten-free baking. Hmmm… I’m not sure but you can definitely try it out! Just omit the brown rice flour and sorghum flour and replace it with 2 cups of wheat flour (preferably whole wheat pastry flour if you have it). I hope you like the brownies! I can’t used red dyes because I am allergic. I use beet powder to make my red velvet items. It gets that deep red color without changing the taste at all. Awww that’s too bad 🙁 I’m glad the beet powder works for you, I gotta try that out! Butter extract IS in fact vegan, the description says it “adds real butter flavor” not “adds real butter.” Plus, I am somewhat sensitive to dairy and I don’t react to this product. You can also use another brand if you don’t feel comfortable with that certain brand. It says it is natural butter flavor and no where does it say it claim non dairy. Can I ask on what you are basing your assumption that this product is vegan? great recipe! they look delish! I actually just contacted them myself just in case, so thanks for letting me know sooner! Made these yesterday and a third of the pan is gone already haha. I used 18g flax in lieu of ener-g, plain erythritol rather than vanilla-infused, 155g beets + 14g coconut oil, and added 1/4c mini dairy-free chocolate chips. This changed the nutritionals to 190kcals/9th of the pan, but hey, that is fabulous. They’re fabulous 🙂 I’m a major beet fan so I love that I can just detect a bit of beet-ness (only when they’re cold, though, when warm it’s just chocolatey goodness). 190 calories sure “beets” (haha? no, I’m not funny…) any other brownie out there. I, just yesterday, found a recipe for red velvet brownie and planed to make them but this recipe beats it. Just stumble upon this recipe and all of it look sooooo good! but I was wondering, if I wish to omit the beet root, will it change the taste of the brownie? Yay I’m glad you think it looks good! I wouldn’t recommend omitting the beet puree because the brownie batter will be too dry and won’t bake properly. I would recommend replacing the beets with unsweetened applesauce (I haven’t tried this, but I think it should work out fine). The flavor won’t change too much, the brownies just won’t be red… they’ll probably be a tan/light brown color. Looks very unappealing with all that dye. You can’t eliminate that for the dye that tastes so terrible? Can you use some bright colored fresh or dried fruit? It would be more wholesome if you did. Just lettin’ you know. The dye I used is all-natural, not synthetic. It comes from beets! Though, I’m glad you tried the recipe! My homemade vanilla sugar is basically erythritol with vanilla beans in it, it’s just for more added vanilla flavor. Also, fat is not bad for the human body, it is an essential nutrient which means its consumption is required for a healthy body, brain, cells, etc. I used ground dried raspberries, eliminated the oil, salt, and sugar to make these truly healthy. I used erythritol in place of the sugar. I don’t need saturated fat in any of my recipes, nor salt. All forms of fat, including flax, damage the epithelium of the vessels, which contributes to congestive heart disease. But otherwise I liked your recipe. Thanks Jessica. Glad to hear the dye is natural and that erythritol is used. But, it sure is expensive. 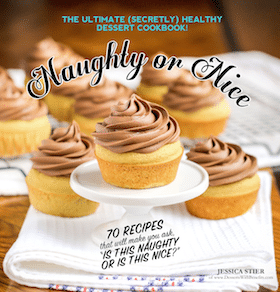 Nice recipe, but I follow Dr J. Mcdougall and J Fuhrman who promote health through low fat eating. Much research to back up their claims. Thanks for the recipe. Yea, raspberry changes the taste–but it’s good. These brownies look UNREAL. They look like little red squares of magic! 😀 I have to try this ASAP! They look so delicious and healthy! I love that there is hidden beets in them and they actually turn the brownies red!